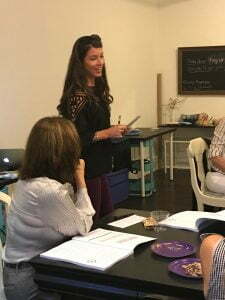 Join in the fun and host a Mini Meeting in your area! 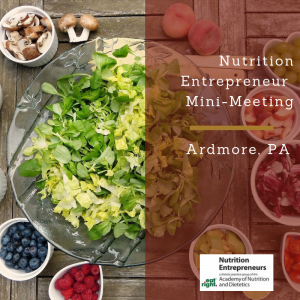 Meet new people and network with other creative and passionate health professionals by joining a local Nutrition Entrepreneurs (NE) group! For NE members, check the NE Events calendar to see upcoming events in your area, or post your upcoming meeting in the Mini-meetings forum in the Hub! If there isn’t a group near you yet, start your own! For more information about hosting a mini meeting please email our NE Administrative Assistant or call (513) 972-4668. Calling all NY/NJ/CT Tri-State Entrepreneurs! REGISTRATION LINK: Click here to register. Can’t make it? No worries, we’ll send you the presentation. Just complete registration and RSVP that you are unable to attend. 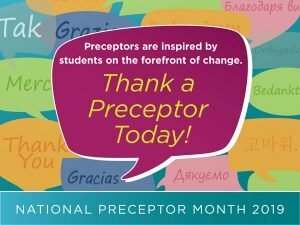 CONTACT: Jeanne Petrucci, MS, RDN [email protected]. Please reach out if you have any questions. Space is limited, so please get this on your calendar asap ? See you in the kitchen! Program Description: Our network can determine our professional success, and if we create networks with the sole intention of getting something, we won’t succeed. 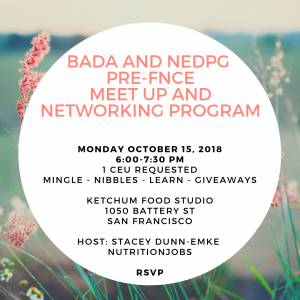 In this presentation, we will define what professional networking entails, identify the tools that can facilitate professional networking, and develop a protocol for nurturing our contacts in our network. 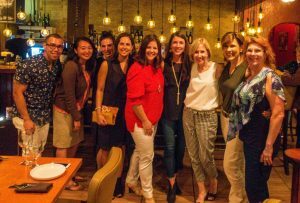 After all, the benefits that ensue from networking come from the investments in meaningful activities and relationships with those in our network. 1. Define professional networking and its benefits. 2. Identify tools to facilitate the networking process. 3. Discuss how to establish a protocol for nurturing one’s network. 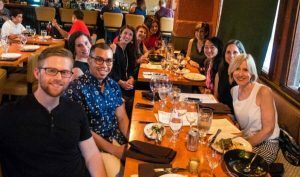 The DC Dietitians are gathering again! 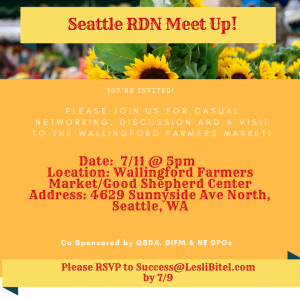 Are you looking to grow your professional network or just connect with other dietitians in a casual setting? 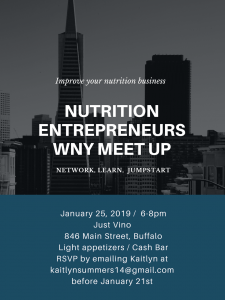 Join us Wednesday, November 28th at the Navy Yard Whole Foods for an evening of networking and learning! This month, in celebration of Thanksgiving, NE’s own Maria McConville will lead a discussion around how we’re giving back to the community through volunteerism. Whether it’s lending your professional expertise to a cause, volunteering within the community, or serving on the board of a local or national organization, giving back is a win-win. Volunteering can open up new opportunities for your personal and professional growth, while helping those in need. Join us to talk about your favorite volunteering activity in DC, or come learn new ways to give back from fellow RDs! 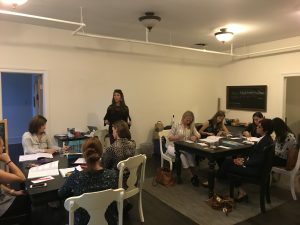 A wonderful informational session on Passive Income Pursuit and Pointers for RDNs by Sohailla Digsby, a Georgia RDN, on September 21st. 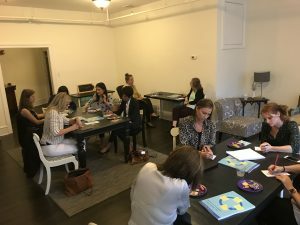 Twelve Philly based dietitians met to learn, discuss, and explore how to incorporate different revenue streams into their business, while keeping the work-like balance. 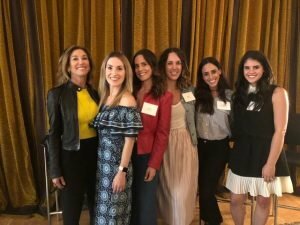 New connections were made among local dietitians with similar missions. The group left with ideas and encouragement on how to get started! On September 12, NE members in the NYC area were treated to a special “Cocktails & Conversation” Mini-Meeting event sponsored by PepsiCo. The event was held at Bouley Test Kitchen and featured a panel discussion of RDs at various stages in their careers working with brands. The panel focused on how RDs have worked with brands, how to get started working with brands, and how the industry is evolving. Moderator Keri Gans lead an engaging discussion and Q&A session featuring panelists Frances Largeman-Roth, Keri Glassman, Alissa Rumsey, Sammi Haber Brondo, and Chelsey Amer. 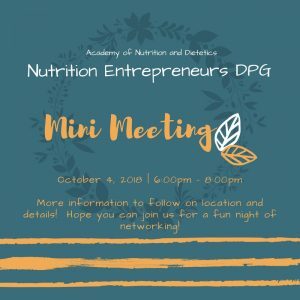 Are you in the DC area and looking to grow your professional network or just connect with other dietitians in a casual setting? 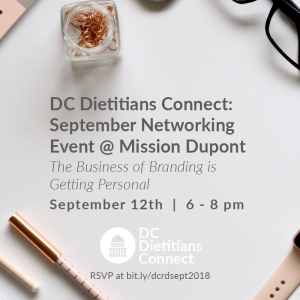 Nutrition Entrepreneurs DPG member Whitney Bateson is hosting a networking event for dietitians September 12th at Mission in Dupont Circle, and all are welcome! The event theme is “The Business of Branding is Getting Personal.” Having a personal brand can be much more than just self-promotion. It can be a personal and private exercise that establishes the confidence, credibility, and courage to prioritize what’s most important in your life. 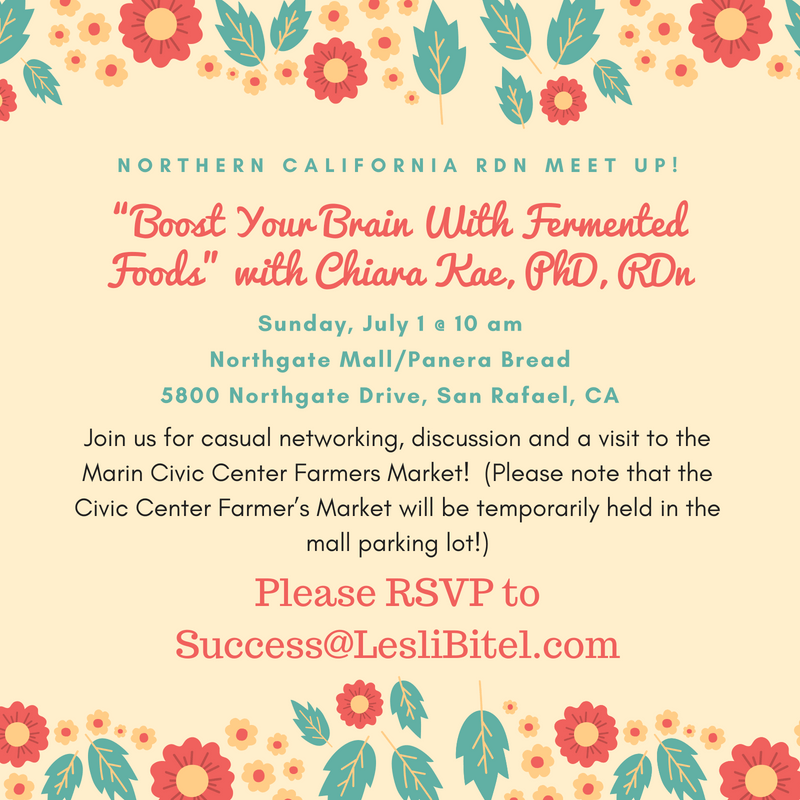 Join us for a discussion on the benefits of personal branding while networking with other dietitians! 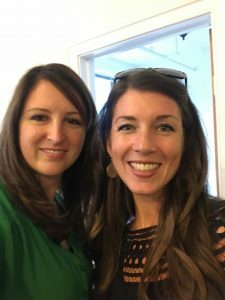 Dallas NE meeting/Happy Hour – Thanks for Joining Us! 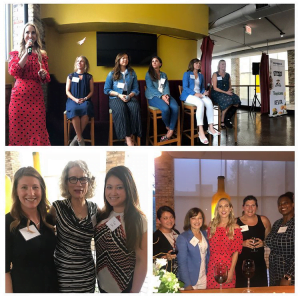 Dallas/Fort Worth dietitians met for an end of the summer Happy Hour and welcomed a fellow nutrition entrepreneur, Sohailla Digsby who’s from Georgia and was in town as a speaker for a fitness conference. The Chicago mini meeting was AMAZING! We had about 25 RDs there, plus the panelists. We had such great feedback on the quality of the panelists/conversation, and the need for more of these conversations. Plus, the SWAG bag was on-point, so that helps. Dawn was also amazing (of course!). Mary Russel came. She was so lovely, and encouraging.